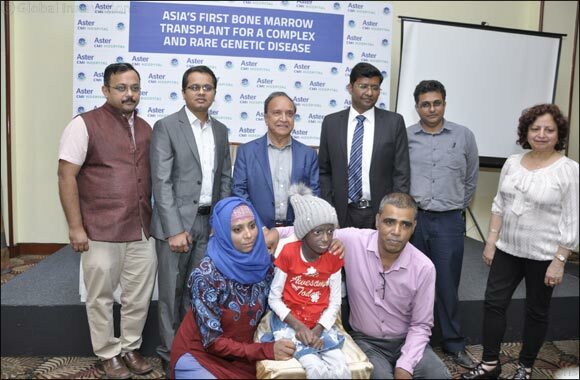 Dubai, March 14th, 2019 – Ciara (name changed), a 13-year-old-girl from Mauritius, suffering from rarest of the rare Complement Deficiency genetic disease, C1q deficiency since the age of 2, became the first teen in Asia suffering from this complex condition to receive a bone marrow transplant. Thanks to the team of efficient doctors at Aster CMI Hospital in Bangalore, a part of Aster DM Healthcare’s global network, for granting her a new lease of life. Ciara was suffering from repeated skin rashes and kidney ailments for over a decade and also developed difficulty in walking and stiffening of lower limbs. Until the transplant, Ciara was on multiple immune-suppressants to control the autoimmune condition – Systemic lupus erythematosus and was being treated with over 10 different medications for her severe skin disease, kidney disease and pulmonary hypertension. “Transplants in children with severe autoimmune diseases and Immune deficiencies are much more complex than transplants for other conditions (thalassemia, leukemia). These children often present with serious infections and internal organ damage, making the treatment more challenging. Our BMT team is well versed in handling such cases and presence of a dedicated Pediatric Immunologist and relevant laboratory facilities helped make this treatment possible,” said Dr Stalin Ramprakash, Lead Pediatric BMT expert at Aster CMI Hospital. As per a research conducted worldwide, 1 in 2,000 children suffer from an immune deficiency. If these figures are extrapolated to the city of Bangalore, around 5,000 children will have immune deficiency disease. Aster CMI Hospital, Bangalore is equipped with the state-of-art Pediatric Immunology Unit, headed by Dr Sagar Bhattad. Aster Immunology and Bone Marrow Transplant Unit provides end-to-end solution to every child with Immune Deficiency. The Pediatric Immunology Department at Aster CMI is one amongst a few centers in India to be recognized as Foundation for Primary Immunodeficiency Diseases (FPID) center of excellence in the field of Primary Immunodeficiency (PID). FPID is an international organization based in US that supports the education, early diagnosis, genetic counseling, therapy, and research of PID in both India and the US. It recognizes institutes for its capacities in the diagnosis and treatment of such challenging cases.